The other day when I was watching a lecture on Youtube, the professor made a joke that some people looked like they came out of a Hieronymus Bosch painting. And then he paused, expecting at least some laughter. The silence, from the classroom full of millennials, was deafening. 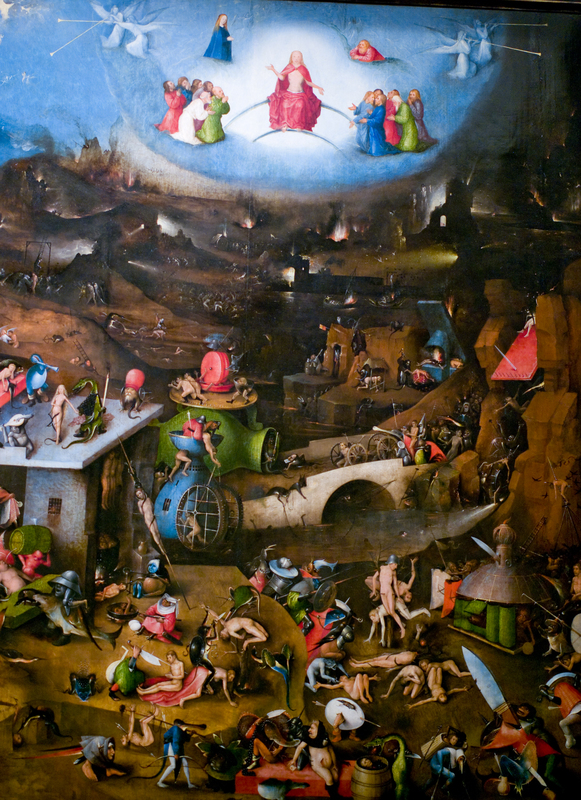 So, with no further ado, here is an example of one of the paintings of Hieronymus Bosch! The Last Judgment, center panel, by Hieronymus Bosch, c. 1482. Academy of Fine Arts, Vienna, Austria. So, one of the first things that you probably thought when you saw this artwork that it was… odd, to put it mildly. Christ is at the very top, seemingly looking down upon this whole scene as ruler. And this is pretty typical, when compared to other paintings of the last judgment! After all, as judge, Christ knows all. But Bosch does something a little different here. In most other last judgment scenes, all eyes are on Christ as they await their judgment. In this painting? Everybody but the saints immediately surrounding Christ are ignoring him. Which, in the context of this painting, seems to make a lot of sense. After all, the people are getting tortured! Not only are they being tortured, but they are being tortured in a variety of horrifically creative ways that seem to be personalized just for them. Some are pierced by trees or arrows and left hanging. Others are being killed by the horrors of war. Still others are having their limbs severed off. One guy is even stuck in an egg, which has been pierced by a long arrow. And on and on the punishments continue. So consumed by their sufferings, they are also ignoring their compatriots, the people who they are suffering alongside them. And nobody is looking to Christ, who is the only one who can save them. So, this is a pretty unsettling picture, quite honestly. After all, when people think of Christ as Judge, they like to think of Him as someone who will make time stop and make the suffering of the world stop for just a moment. That way, we can be bathed in glory and be able to think straight so that we can see God and know Him for who He really is and thus be able to follow Him more clearly. But, that’s not really how the world works. Our lives are full of suffering, will continue to be full of suffering, and, when we are finally called to be judged, we will be called as we are, whether we are ready for God — or not. So, what is one to do in this fallen world in the midst of profound suffering and discord where scary world events seem to happen every day? He is the only One who can save you. And, how can we help out each other? Well, we need to pray for each other and try to help each other out to the best of our abilities. After all, every one of us has a cross of suffering that we have to carry — and even Jesus needed help carrying His own Cross. We should do our best to help each other in this world of suffering. And, another idea? For the souls facing judgment right now, it is always good to pray for the souls in Purgatory. Because sometimes, they need just a little help to turn their faces toward God. Thank You for coming down as a man so that You could understand and help us through our own suffering and even save us. May we always turn to You in the midst of our own suffering and keep our focus on You.